Today, I woke up to a snowy base camp, had breakfast in the mess tent, and then headed up to Ferran’s camp for a meeting to discuss our plans for the coming days. 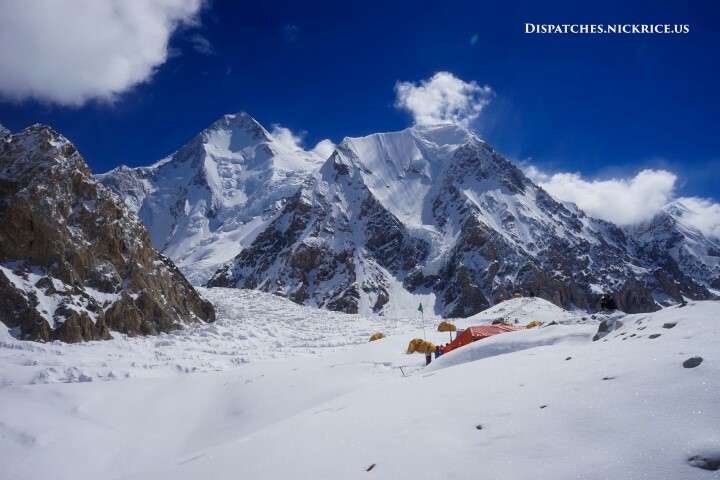 We compared weather forecasts and more or less decided not to leave for Camp I tomorrow early in the morning as the Gasherbrum II climbers are. 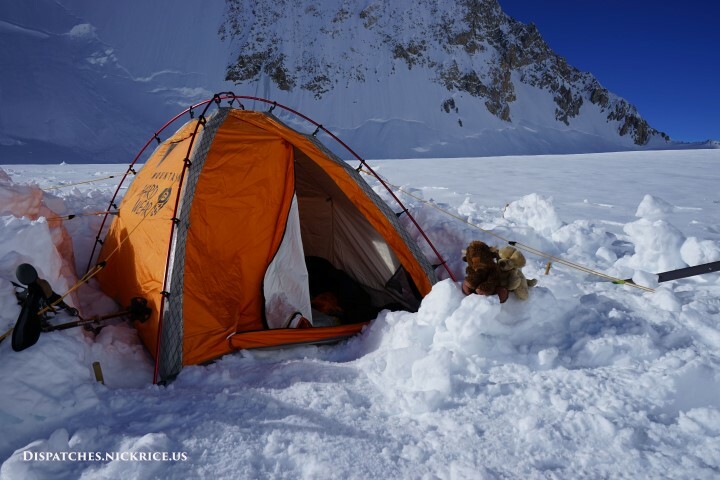 We instead will try and reach Camp II directly the following day when the weather is supposed to be good and the new snow will have had time to settle. 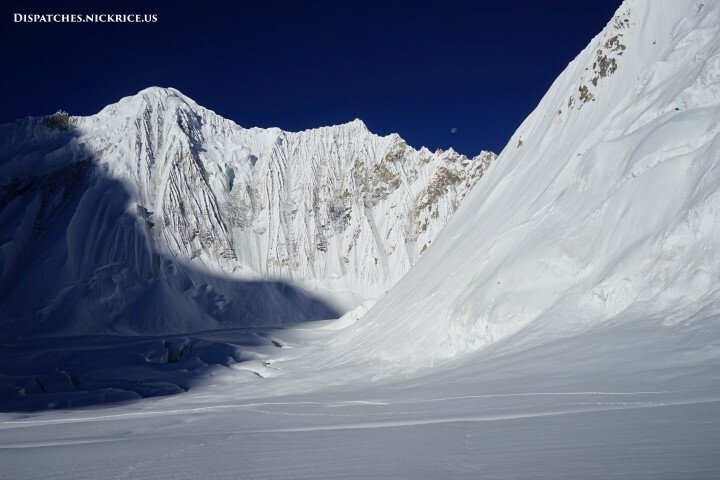 We are planning on bringing everything we will need for a summit bid in case the weather decides to cooperate and we have sufficient energy after fixing the route from Camp II to Camp III in the Japanese Couloir. After this meeting, I headed back down to my base camp for lunch, then worked on packing my gear for the potential summit bid. At 5pm, we had another meeting in the Taiwanese camp where we finalized plans for going up. Tom and I stopped briefly in Peter’s tent (Kobler commercial expedition) where we confirmed that his group will leave tonight. I finished watching a movie in my tent, then had dinner in the mess tent where Harald was packing his bag for a climb to Camp I tonight. 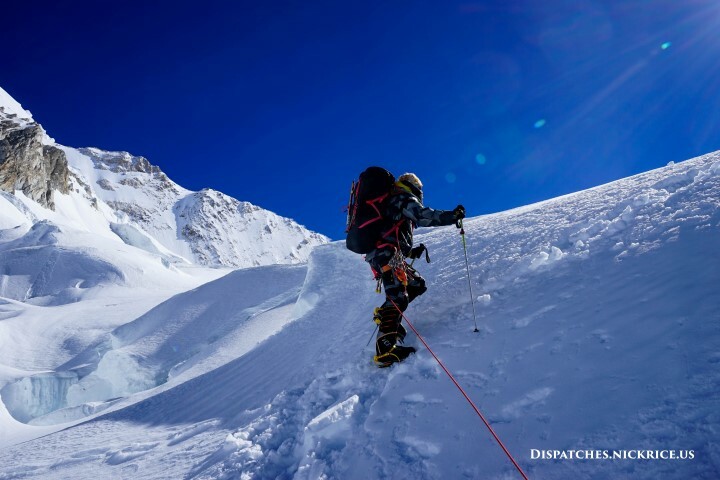 Although he is climbing on Gasherbrum I, he will be acclimating on Gasherbrum II. Let me but soar in that sky in its lonely immensity. Let me but cleave its clouds and spread my wings in its sunshine. Today, I woke up to close to 9 inches of snow outside my tent. After clearing the snow from my tent and my solar panel, I made my way down to the mess tent for breakfast. Afterwards, I walked up to visit Ferran to discuss our plan for the coming days as well as to compare weather forecasts. The Taiwanese climbers also joined in the meeting and we discussed a number of contingency plans depending on how much snow falls and how the weather forecasts change over the coming days as they always do. Afterwards, I returned to my base camp for lunch. The social nature of base camp is vital to keeping climbers cheerful during periods of bad weather. After having invited Kinga over for tea a number of times to no avail (our camps are a 20-minute walk apart), I decided to write her a formal invitation to dinner in our mess tent. I handwrote the invitation on the back of my flight itinerary and added some of the fake flowers from our mess tent to dress it up. Akbar (my cook) hand-delivered the invitation to her camp and dinner was then official. Some Pakistani army officers came over to our camp in the afternoon and helped work on the generator. After close to an hour, they returned to their camp with no success, promising to return tomorrow. Manzoor started up the barbeque and Kinga made her way down to our base camp, arriving around 7. We had a delicious dinner prepared by Akbar in our warm mess tent, followed by a movie. We unfortunately chose to watch the Hobbit, which runs almost three hours, so about half way through, we decided to adjourn and I walked her back to her base camp. Today, I woke up at 7:30am, ate breakfast in the mess tent with Harald, and then quickly packed up my tent so I could re-make the tent platform. Last night’s sleep was interrupted by me sliding down the slope that had formed in my tent (the tent is placed on glacial moraine, so after a period of warm weather, the sides tend to melt). Manzoor and some of the staff from other expeditions helped me move stones to make the platform flat again and after this was done, I spent the rest of the morning unpacking the contents of my tent and reorganizing as it began snowing outside. I had lunch in the mess tent, and then had a visit from Tom (Germany) and a Polish climber followed by a visit from a Czech climber. The afternoon was spent working on the generator which hasn’t worked since we have arrived in base camp. Afterwards, we had dinner, watched a movie, and then went to bed as it began to snow hard outside. It continued all night. Simone descending toward Camp I (6000m/19,685ft) in the pre-dawn hours of the morning. Today, we woke up at 2:00am, ate breakfast, and packed up our equipment in Camp II. The night had been windy and spindrift had filled in the small wind screen I had made from snow for my stove. Luckily, when it was time to get out of the tent, the winds had calmed and a half-moon lit the way. The three of us quickly began descending through the ice fall toward Camp I. The route had been partially obscured by the wind and spindrift so we had to route find in a few sections. We arrived to Camp I in just under an hour and a half. I quickly unpacked the gear I will leave in Camp I and changed out of my down pants into gore tex for the remainder of the descent to Base Camp. We left Camp I at 5:20am and made our way quickly towards base camp, the thought of a hot breakfast and a shower driving our pace. We arrived at 8am. I was met on the glacier close to base camp by the other member of my base camp team, Harald Hablacher (Austria), who had just arrived. We spoke briefly as I continued toward base camp. Upon arriving, I had a Pakistani tea, quickly showered, and then had breakfast. Next I went up to visit with Ferran. We made plans for the coming good weather window to go directly from Base Camp to Camp II and fix the route in the Japanese Couloir, and if weather and snow conditions allow it, perhaps make a summit attempt. After chatting with Ferran, I got into a political conversation with their liaison officer. Our thoughts on US-Pakistan relations aligned well. Afterwards, I rushed back to my base camp for lunch, chatted more with my new Austrian companion, and spent the rest of the afternoon relaxing and drying my climbing equipment. I will spend the next few days of bad weather recovering in base camp and preparing for a potential summit push. Today, I woke up at 3:30am, struggled to eat a small breakfast in my icy, cold tent, then packed up all of my equipment, put on my harness and crampons, and ventured out into the sub-zero temperatures of night. I roped up with Simone and Richard, and we quickly began heading over the plateau toward the ice fall leading to Camp II. After touching nearly everything in my tent as I packed (bear in mind that everything not in my sleeping bag was covered in a thin layer of ice crystals), my hands were frozen before leaving the tent. They did not warm up as we climbed and I struggled in vain to restore circulation at our first break at the base of the ice fall. It wasn’t until we reached the top of one of the seracs when the sun crested above the ice fall that my hands finally had a chance to thaw. The process was incredibly painful, but once it was done, I was finally able to enjoy the climb. 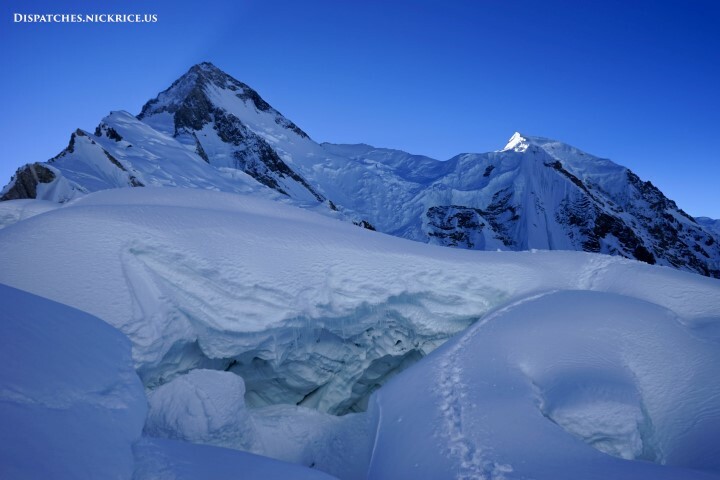 We continued up the ice fall until we reached the plateau between Gasherbrum I and Gasherbrum II. After another 20 minutes, we reached the tent placed by Ferran (it was the only tent in Camp II). I quickly began digging out a tent platform nearby for my small Mountain Hardwear EV2 direct and reinforced the platform with ice walls to protect the tent from high winds in the col for the coming storm. Once the tent was secure, I quickly moved in and made water and food. The sun kept the tent warm and helped me dry my equipment. Around 4:00pm, clouds cooled the tent and we all got into our sleeping bags and cold weather gear. The three of us felt great at this altitude. 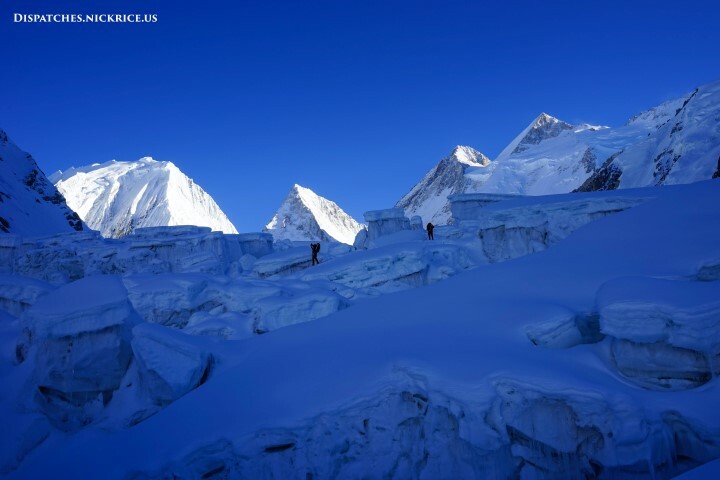 We intent to begin descending tomorrow morning at 3:00am so as to reach Camp I by 4:30am and then once we have cached the equipment we need there, continue down to Base Camp, hopefully arriving in time for breakfast and a shower. 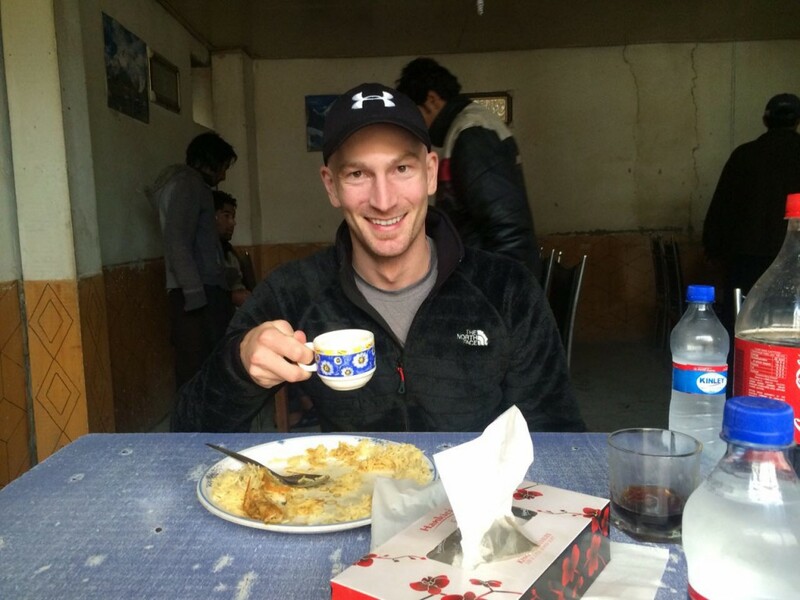 Today, I woke up at 2:00am, packed up my equipment, ate a quick breakfast with Akbar, and headed up to Camp I. As mornings go, it was a rough one as I quickly became hot as I began climbing, but I made steady progress climbing solo through the ice fall to Camp I. A poignant memory of a certain special someone gave me a second wind and I arrived to Camp I at 9:00am, quickly re-made my tent platform and reinforced it for the coming snow storm. I spent the afternoon killing the time in the tent as the sun baked everyone in their tents in Camp I. In the late afternoon, I found out that the Taiwanese planned only to climb to Camp II then return the same day to base camp. 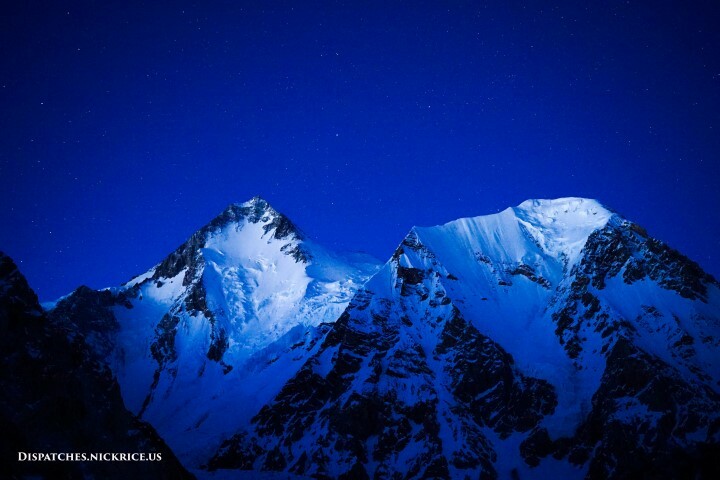 I instead made plans with Richard (Peru) and Simone (Italy) to climb to Camp II to sleep. We decided to leave Camp I at 5:00am and travel together as a rope team. Afterwards, I spoke for quite some time with a Czech climber who is attempting Gasherbrum II, made dinner, then went to sleep early. 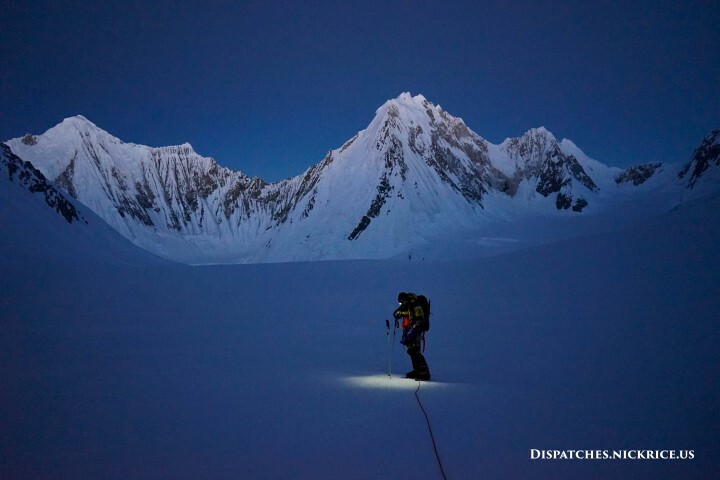 Today, we woke up at 4:30am, had a quick breakfast, and quickly began trekking to Gasherbrum Base Camp. The snow from last night made the way more difficult, as the small crevasses that riddled the route were covered with weak snow bridges. We punched through more than a few along the way. We arrived to Gasherbrum Base Camp at 10:00am and waited anxiously for our porter loads to arrive. The loads that had come with us to Shigring and those coming from Concordia arrived quite soon after we did. I double checked that everything had arrived then tipped the porters before they headed back down. The place we chose for our base camp was quite steep and required a great deal of effort to make level enough for the mess tent, kitchen tents, and our personal tents. We worked all afternoon on this, the effort made harder by the newly fallen snow and the fact that the stones were frozen in place. We were startled as mortar fire erupted from the army camp just across the glacier from us. It continued all afternoon and we were told it was for target practice and not to worry. It began snowing again in the afternoon so I spent that time setting up my solar charging equipment inside my tent. 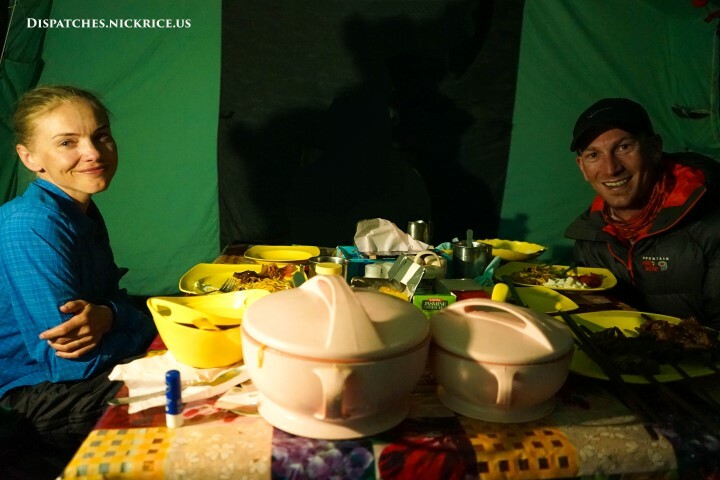 I had dinner in the kitchen tent with Akbar and went to sleep around 8:30pm. It began snowing quite hard around 1am and continued for most of the night. Today, Akbar woke me up at 4:30am, I ate a quick breakfast, and we began trekking in fresh snow to Concordia (4585m/15,042ft). Akbar woke the porters early so they would arrive on time to Concordia. Once there, I had a tea with the K2EV rescue team while the porter loads were sorted into what we would need immediately and what we could do without for a day. 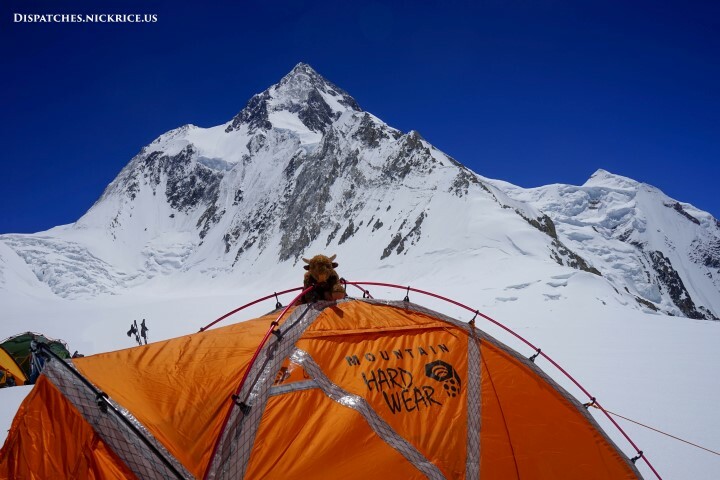 Fida was successful in recruiting additional porters, however, due to the late hour of the day, they preferred to go directly from Concordia to Gasherbrum Base Camp tomorrow rather than climb with us to Shigring today. Once the equipment was sorted, we headed up to Shigring in knee deep snow. An hour or so into the trek from Concordia, the weather deteriorated and it began snowing quite hard on us. We were relieved to see the army post which is just 25 minutes from Shigring. 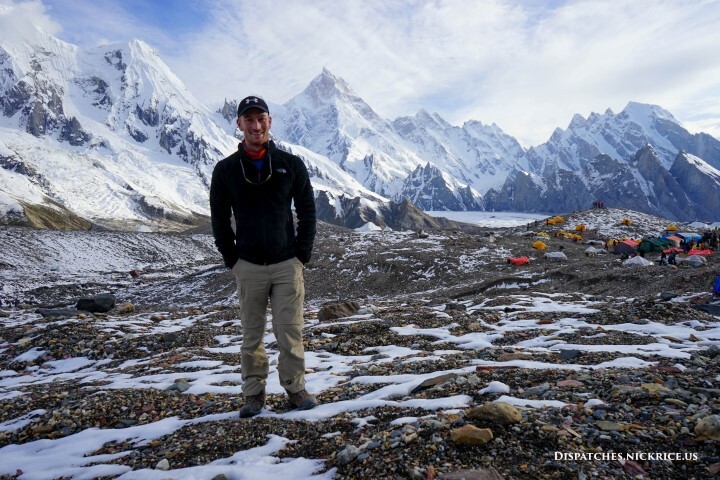 Once we arrived, we waited an hour for the porters, set up camp, had a quick diner, and enjoyed the sunset over the Karakorum as the weather cleared just before dusk. Tomorrow is the last day of the trek to Base Camp. Today, we woke up early, had a quick breakfast and started toward Goro II. The morning was again cool but around 9am, we were blessed with views of Mashabrum and the peaks surrounding Concordia (Mitre Peak, Marble Peak and Gasherbrum IV). 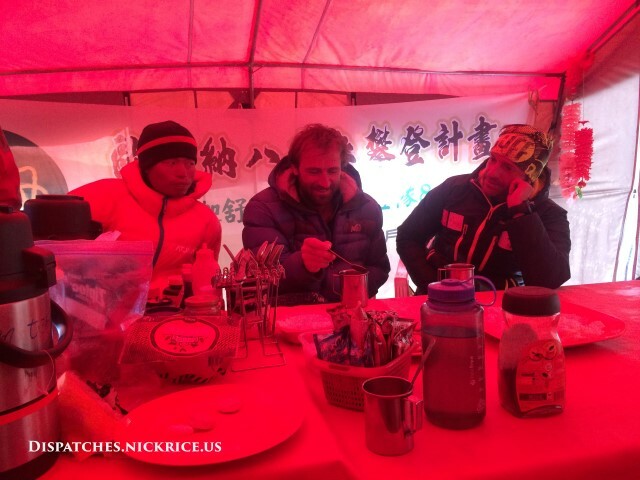 We broke for lunch at Goro I (4232m/13,886ft) and continued on to Goro II (4305m/14,124ft), arriving before noon. We waited endlessly for our porters and donkeys to arrive with our equipment. When they finally did, we quickly set up camp. High winds began blowing as soon as we started putting up the tents. It snowed in the afternoon and cleared up again in the evening, affording us views of Mashabrum at sunset. We went to sleep early. Fida will leave around 3:30am tomorrow morning to see about recruiting porters at Concordia to ferry the loads carried up to this point by horses and donkeys. 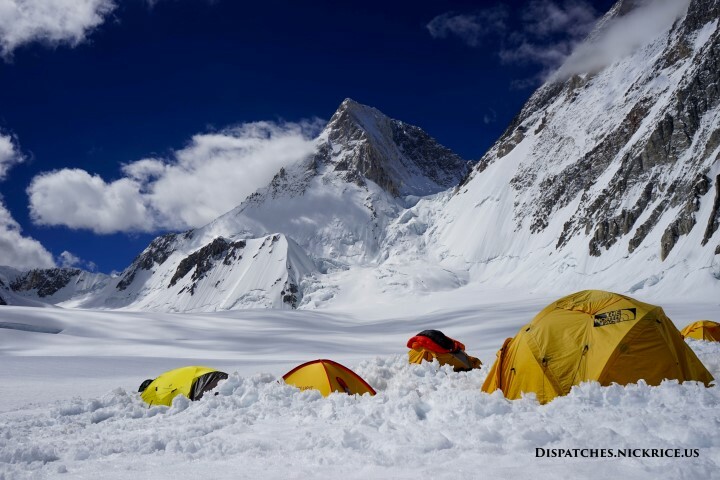 We have heard that the route from Concordia to Gasherbrum Base Camp has up to three feet of snow in some parts. 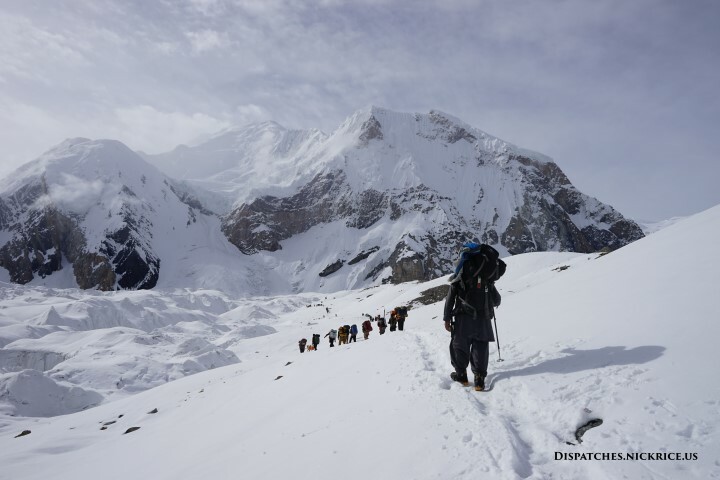 Hopefully, he will be successful in getting the porters and we can arrive on time to Base Camp with all of our equipment. Today, I woke up at 5:00am, packed up my equipment, ate a quick breakfast in the mess tent, and began the trek to Urdukas. The morning was cloudy and cool and the sunrise over the Trango Towers was beautiful. 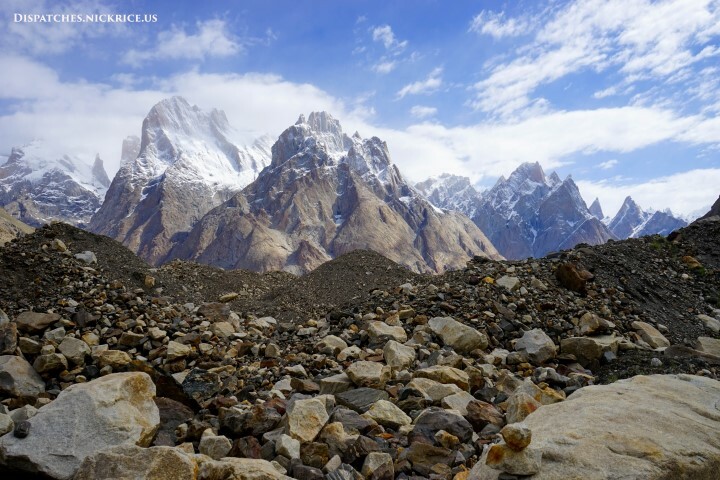 About an hour into the trek, we gained the Baltoro glacier and proceeded up and down over glacial moraine until we had crossed the width of the Baltoro Glacier. 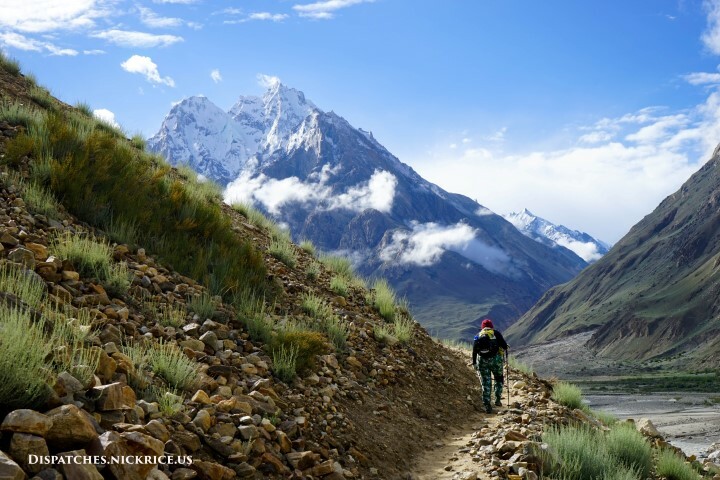 The cloudy morning gave way to a clear afternoon which yielded stunning views of the jagged rocky peaks of the Karakorum covered in fresh snow. We broke for lunch at Koburtse (3850m/12,630ft) and waited endlessly for the porters to arrive then continued on to Urdukas. The route had changed considerably from the one I took last year and proceeded over avalanche and land slide debris. Once we arrived to Urdukas, we quickly claimed a camping spot. It began snowing again in the afternoon and a trekking group was gracious enough to invite Marek (Czech Republic) and me into their mess tent for tea. We chatted for a bit and after an hour or so, our equipment arrived and we headed down to our own mess tents for dinner. The night was cool and after dinner, I quickly got into my sleeping bag and went to sleep early. Tomorrow, we will trek to Goro II. Today, I woke up at 7:30am, had a leisurely breakfast with Akbar, and then showered (with a bucket and can). 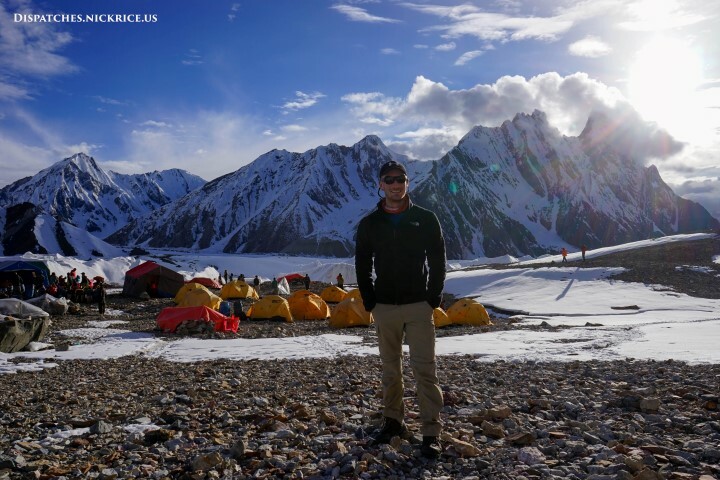 Afterwards, I tended to some of Akbar’s wounds that he’d gotten in a motorcycle accident prior to the expedition, then headed down to the big Leila Peak expedition’s camp and chatted with other climbers there that I knew from previous expeditions. After this, I had lunch, read in my tent, ate dinner, and then had a long chat with Cleo Weidlich (USA) who is attempting K2 this season. We spent over an hour reminiscing about past experiences here in Pakistan. When I walked out of her mess tent, I was greeted with a clear night with a full moon that made Paiju peak appear to be covered in snow. Tomorrow, I will trek to Urdukas. About an hour into the trek I will begin climbing on the Baltoro glacier. 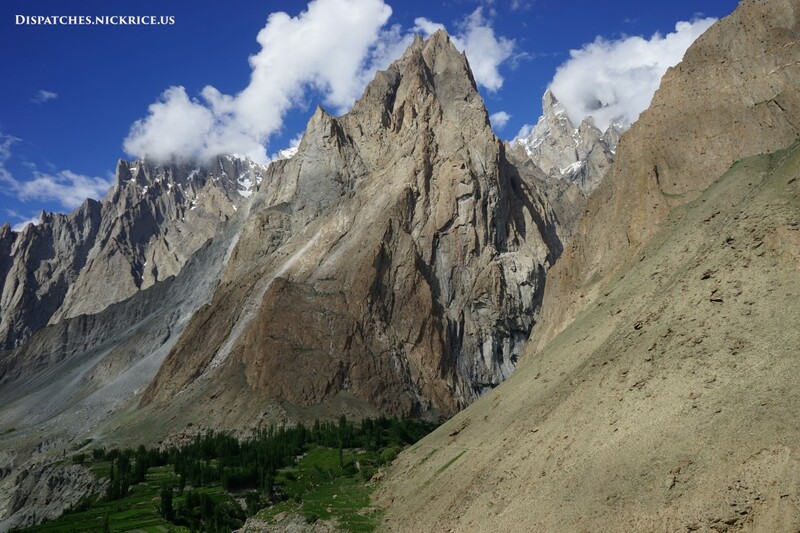 I am hoping for a cool day as this trekking day is the longest and the route proceeds over glacial moraine which on a windless, warm day makes for hellish trekking conditions. Today, I woke up at 5:00am, packed up my things, and ate breakfast in Jhula which was cloudy and cool. It had rained hard in the night, but the morning was again damp and cool, perfect for trekking. We broke down camp and began the trek to Paiju. We stopped for lunch at Moncamp (3215m/10,548ft) and this time, the porters were not far behind. We continued onto Paiju with scattered showers along the way. After 24km/15 miles of hiking, we arrived and quickly claimed a spot in the shade. In the evening, I noticed that I was coming down with the same upper respiratory infection that all of the porters and staff have so I started myself on antibiotics and hope it will go away before arriving to base camp. We will rest here tomorrow to allow the porters to rest and to prepare their food for the coming days of trekking to base camp. Today, I woke up at 5:00am, packed up my things, and ate breakfast in Askole. 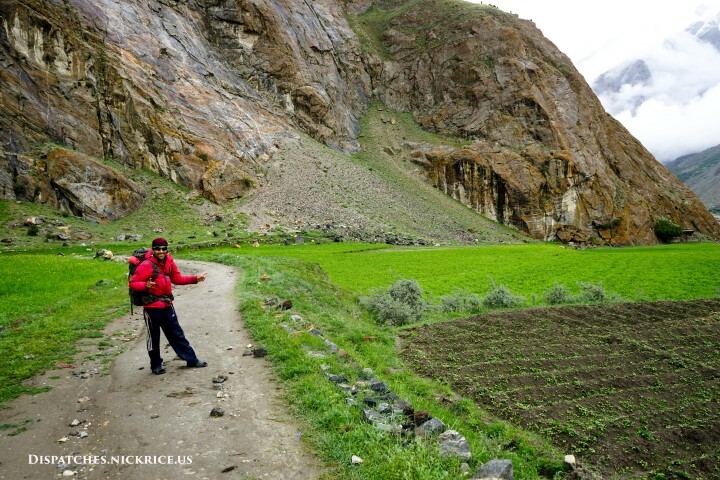 I waited around as porter loads were being divided, then began the trek to Jhula with Akbar. The morning was cool and damp, a welcome change from last year’s scorching temperatures. After registering with the Karakorum National Park office, we continued on to Korofong (3057m/10,030ft) where we waited over two and a half hours for the porters to arrive. We then ate a quick lunch and continued onto Jhula as the weather worsened. We were frustrated by the fact that as soon as it would start raining hard and we would stop and put on goretex, the rain would stop and it would become too hot to continue without taking off layers. We arrived to Jhula around 1pm and waited almost four hours for the porters to arrive with our equipment. While waiting, I made friends with one of the chickens who will be my dinner in the coming days. There are over 350 people (climbers and porters) trekking on the same schedule as me so the camps will inevitably be crowded and chaotic, increasing the likelihood that a bag will be misplaced or lost. After setting up our camp, I had a fantastic dinner and went to sleep. Tomorrow we will continue the trek to Paiju. Today, I woke up at 5:30am and repacked all of my equipment into 25kg loads in preparation for the jeep ride to Askole. Afterwards, I spoke with Fida who said that we would not be leaving as early as planned since our military clearance had not yet been completed. I ate breakfast and returned to my room to wait for news. Finally, around 11am, Fida returned and informed me that the military officer in charge of approving our clearance was still not in the office and asked me if I’d like to leave for Askole today if the clearance is received in the afternoon. Since driving on the jeep track late in the afternoon is hazardous (many rivers fed by snowmelt cross the track and swell in the late afternoon making passage more dangerous), I elected to depart tomorrow. It turned out that we didn’t have a choice. I asked for an update around dinner time, and the clearance was still not received. I can only hope that the officer is present tomorrow and that the clearance is received in the morning.